It is time again for the Pumpkin Preview. The first of four pumpkins in our indie game lineup this year has become a permanent fixture in our local multiplayer circuit. Crawl is a competitive game for up to four players. The unpredictable dungeons and constant power struggles are enough to keep us playing into the wee hours of the morning. One player controls the hero, while the other three play disembodied spirits who possess the randomly generated dungeon's traps and monsters in an attempt to kill off the hero. Any player who kills the hero becomes the new hero. Once a player has chewed through enough monsters to reach level ten, they can take the fight to the game's final boss. 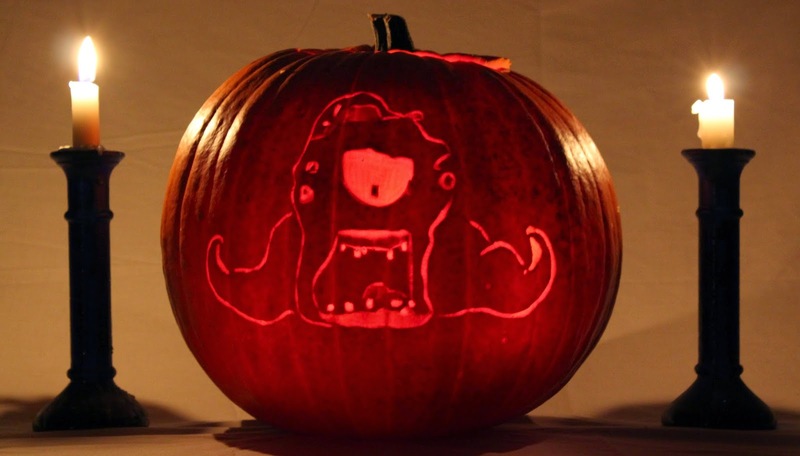 The hulking abomination was the inspiration for our pumpkin, and we hope to appease him with this offering. Crawl is in Early Access on Steam at the moment, and is already an outstanding game. I recommend that you play it with friends and leave the ai opponents out whenever possible. With even one in the game, the flow and feel of the game distinctly shifts. Instead of the weird and frenetic backstabbing ballet, the players in attendance tend to team up against the bot. The average game lasts maybe twenty minutes, but it's easy to drop several hours on playthrough after playthrough. The graphics have a distinct retro flare to them but the detail of the animations (especially the deaths) are a visual feast. Crawl is one of my current favorite games. With new items, monsters and weapons unlocked on each game, constantly shifting dungeons, no two games will play out the same way. Crawl is available on the Humble Store and Steam for $9.99.